Ever since we heard that Japanese architectural firm SANAA was designing the first-ever Derek Lam boutique rising in southern Soho, we were intrigued. The duo, who were responsible for the Bowery's meshy New Museum, are known for their ambitious, futuristic work. 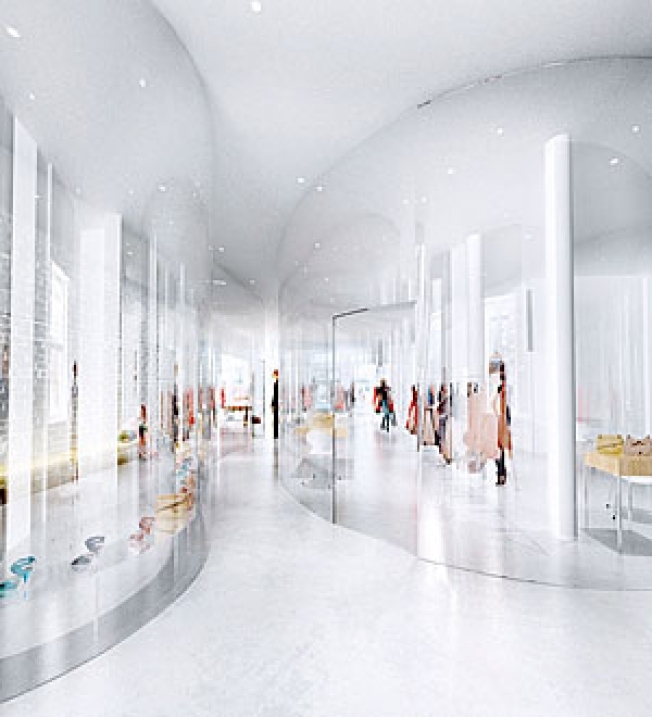 Our first glimpse of that work comes not from likely candidate WWD, but from Architectural Record, which has an agonizingly small image of the boutique's interior. In the accompanying article, we learn that the 2,300-square-foot shop was supposed to open Tuesday the 7th (no one's answering at Derek Lam's showroom, so we don't have an updated date as of yet). More on the decor: "The store’s aesthetic is about as pared-down (and as typical SANAA) as you can get: A series of curved partitions crafted from clear acrylic create 'rooms' within the store, each housing a different collection, while the space’s original brick walls are painted white, suggesting an exhibition-like atmosphere." Step aside, Koolhaas-designed Prada boutique.